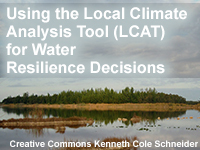 This lesson offers users of climate information a demonstration of the utility of the Local Climate Analysis Tool (LCAT) for water resources applications. The training follows a NOAA Climate Resilience Toolkit case study in Tampa, Florida, and illustrates how LCAT analyses can be used to inform the steps to climate resilience outlined in the Toolkit. This text-based, interactive lesson will be accessible to anyone using LCAT for water resources decision-making, though will be most useful to those with some familiarity with drought/water resources questions and information needs. Some background with National Weather Service climate data and products will also be useful. I had to think and it was easy to learn. very good lesson plan. started off will little knowledge, now I cannot wait to use the toolkit!